One of my favorite meals to grill up during the week is chicken quesadillas. They are simple, healthy, and very flavorful. You will notice that chicken breasts have a thick end and a thin end. One important tip is to use a meat mallet to pound the thick end of the breast, making it all one even thickness. This step will ensure that your chicken cooks evenly! Make sure to put a piece of plastic wrap over the chicken before you smash it, this will help to eliminate cross contamination. Get a light coating of olive oil on your chicken breast then season with salt, pepper, and granulated garlic on both sides. Grill the chicken on a direct medium-high heat, around 450 degrees, for about 8 to 10 minutes, flipping once. The chicken is done when it’s reached an internal temperature of 165 degrees. I recommend using a meat thermometer to check for doneness, especially when cooking with poultry. After taking the chicken off the grill, let it rest for 3 minutes and then dice into pieces. Fire roast your bell peppers on a direct high heat, between 450 and 550 degrees, for 8-10 minutes. When the outside skin starts to look black, after about 10 minutes, you will take the peppers off the grill, place in a bowl, and cover with foil for 5 minutes. After the peppers have rested, you will remove the outer black skin, remove stem and seeds, and dice into pieces. For a little extra spice you can fire roast some jalapeno peppers and add them into your quesadilla as well. Slice your onions into half inch piece and coat with olive oil. Grill onions at a medium heat, around 400 degrees, for 6 minutes, flipping once. Remove from the grill and dice into bite sized pieces. First you will lay a tortilla down flat. I like to use whole-wheat tortillas to keep on the healthier side. Then you will add an even layer of shredded cheese over the entire tortilla, this is what holds the quesadilla together. I like to use a Monterey Jack shredded cheese, but the type of cheese you choose is totally up to you. From there you will add the diced chicken breast, fire roasted peppers, and grilled onions to half of the tortilla. Do not overfill the tortilla with toppings because it will be difficult to fold over, you can always make a couple! I find it easiest to take the side without all of the ingredients on it and fold that over onto the side with all the toppings. Then you will place it on the grill on direct medium heat, around 350 degrees, for a total of 6 minutes flipping once. 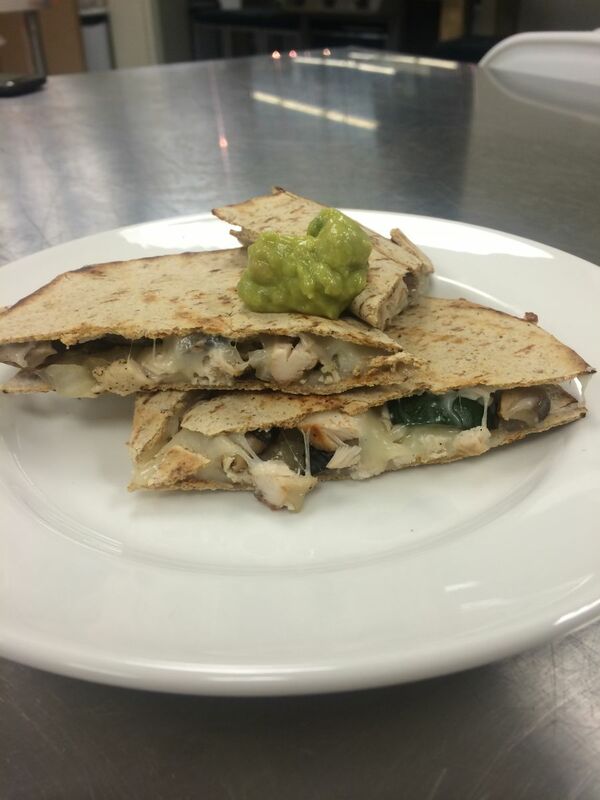 Add a dollop of sour cream, avocado, and diced tomatoes to the top and you have yourself a tasty chicken quesadilla. Enjoy and Grill On!